1 What Exactly is Scrum? 2 What are the Scrum Methodology Steps? 3 Why Should I Use Scrum? In 2017, scrum methodology steps were used by over 2000 companies in 47 countries across 15 industries. A component of the framework used in Agile project management, Scrum is quickly becoming the go-to strategy for companies across the world due to its ability to prioritize tasks and encourage teamwork. Keep reading for a breakdown of this popular productivity tool and how to implement it into your own projects. Have you ever seen a whiteboard with loads of sticky notes in columns? That’s Scrum. Though it can look chaotic to the untrained eye, it’s actually known for reducing the chaos surrounding big, complex projects. It is a self-organizing and team-oriented project management method used to break down complex projects into small, manageable tasks. The key components of a scrum group are the scrum master, the product owner, and the scrum team. The product owner is usually the key stakeholder of the project, and it’s their responsibility to convey what they want to the group. The product owner creates a prioritized list of tasks (the backlog) and explains the desired outcome of the project to the team. The Scrum master is the leader of the team but is different from other types of project managers in that they do not micro-manage. They are there to facilitate meetings and keep the project on track, not to nitpick and watch with an eagle eye. Arguably the most important part of the Scrum process is the Scrum team. This is a group of qualified people who self organize and divide tasks amongst themselves based on their individual skills. 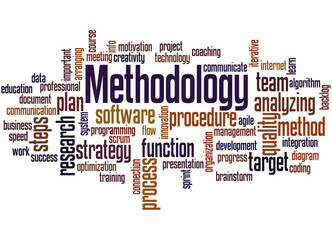 What are the Scrum Methodology Steps? Once the product owner determines the backlog, the team breaks it down into sprints. A sprint is the projected time it should take to complete a set of items from the backlog. The number of sprints will depend on the size of the project. Each day, the team will have a short, concise daily Scrum meeting to go over progress and discuss what went well and what needs improvement. The Scrum master facilitates and oversees these meetings to ensure everything stays on track. At the end of each sprint, the team meets for a sprint review and retrospective. At this point, all of the tasks in the sprint should be completed to stakeholder standards and then it’s on to the next. This process is repeated until the project is complete, or the budget and resources are exhausted. Hopefully the former happens before the latter. It is the Scrum master’s job to ensure the project remains on time and on budget. Why Should I Use Scrum? Scrum is a component of the Agile Manifesto, a project management strategy that began in Japan and quickly became an alternative to the traditional waterfall method. The Agile method is known for its flexibility and allows for changes to be made along the way, as opposed to the rigidity of the waterfall method. It allows for individuals to shine while also working cohesively as a team. When executed properly, the implementation of Scrum techniques can increase productivity by up to 200%. Client communication is key, and when teams work together for the greater good of a project, everyone wins. Visit the UAB BSIS site for information on online courses to extend your knowledge. Following Scrum methodology steps is a template for success, especially for complex projects. We hope this helped get your head around the Scrum process. For more useful information, check out our many blog posts on various topics in tech, business and beyond.